This winter, snuggle up next to foods that will do more for you than fill your belly. With our simple trick, your food will warm your soul as well. It starts with using fresh, in-season organic fruit as a staple ingredient, then trying new creations! Seasonal cooking requires knowing what’s currently available, right? At Homegrown, the winter lineup includes organic navel oranges, lemons, grapefruit, red Cara Cara navels, minneolas, pummelos, satsumas, clementines, W. Murcotts, limes, and Asian pears. There is something for everyone, including you. There are times in life you may become stuck in a meal-planning rut. You know the type, where you end up cooking the same meals over and over again. You do not have to stay in that place! We’re glad you’ve joined us because our winter recipe picks are sure to help break you out of that slump. Let’s get your meal plan back on track. First, pick up ripe organic blood oranges and Cara Cara navels to pair with freshly caught salmon. With them, you have what we call the home-field advantage of ingredients. While the flavors of this dish easily impress, the most amazing part is the vibrant presentation of thinly sliced citrus laying across a perfectly-broiled cut of fish. 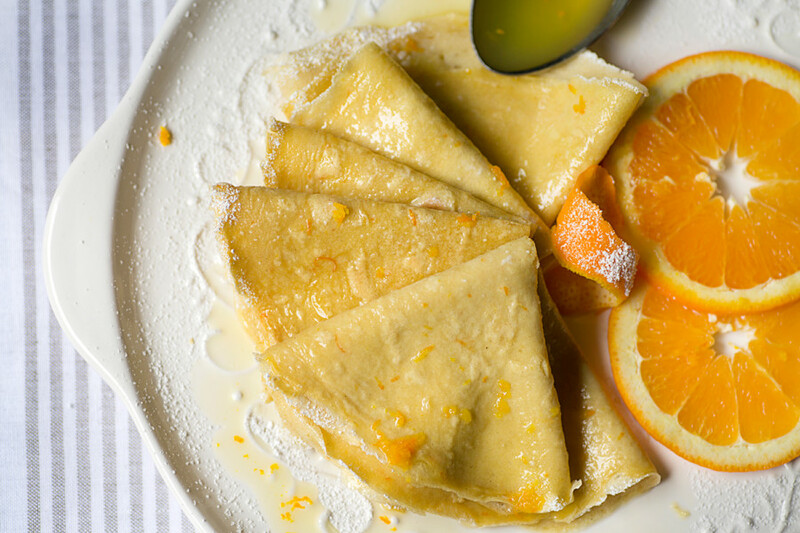 Next, from our recipe box, is the Orange Crepe recipe you didn’t know you’ve been searching for. 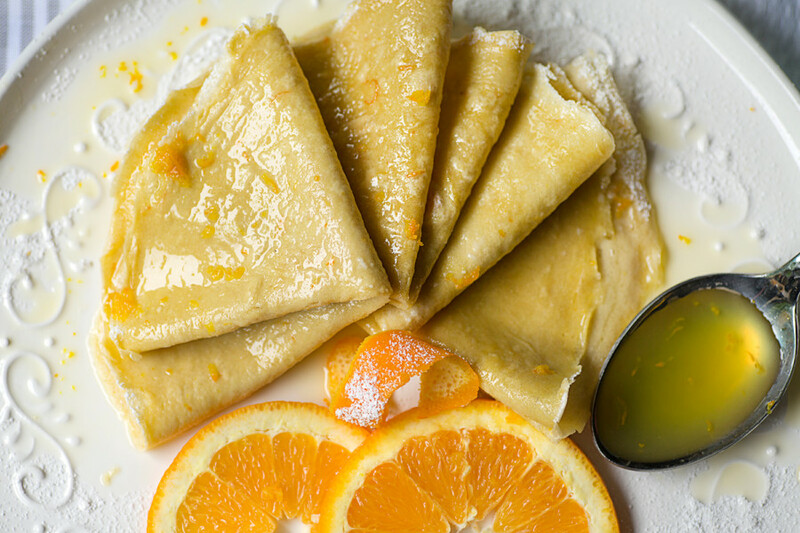 Each crepe is light, yet full of flavor and you’ll be pleasantly surprised to find a few troublesome ingredients missing: gluten and dairy. Can we get a huzzah? Thankfully, it is once again possible for everyone with sensitivities to enjoy crepes without enduring a single negative side effect associated with ingesting gluten and dairy products. We know what you’re thinking, just because the dairy and gluten are missing doesn’t mean that the flavor is. Quite the opposite, actually, so get grubbing! Organic pummelos from Homegrown ripen up in November and remain in-season through February. Additionally, pummelos are a traditional part of the Chinese New Year’s gift-giving celebrations. Large and similar in appearance to grapefruit, pummelos remain popular among folks with a palate coded to enjoy anything tart and sweet. Already craving these bright flavors? The pummelo smoothie bowl is definitely calling! Your search for a masterpiece of plated winter citrus can come to an end. Here are the six words you’ve been waiting for: Pecan Crusted Goat Cheese Citrus Salad. The gradient-like shades of red and orange pop in contrast against the bed of leafy greens. And we haven’t even touched on the salad’s flavor yet (hint, it’s to die for)! Topping your favorite eats with winter citrus is a wonderful, easy way to recreate an ambiance of warm, sunny days; especially if you’re not a fan of these cool winter months. It’s fun to infuse as many in-season, organic fruits into a single dish as possible. Especially when a combination of flavors teams up perfectly to create an easy dessert. That’s what makes this coconut tart recipe so fabulous. It beautifully highlights two of our most popular citrus fruits (lemons and blood oranges), while the subtle coconut notes throughout tie the flavors together. Has there ever be enough fruit-filled dessert at get-togethers? We don’t think so, so, we felt compelled to include this cookie recipe. Flavorful, sensory-awakening orange slice tea cookies offer a presentation on par with their flavor. This is the kind of cookie you’ll be proud to gift during Christmas time. Make sure to hide the cookie jar! Each winter means we’re blessed with an opportunity to cook with many classics. Stay sharp as the seasons change from fall to winter, to spring, and let in-season produce (both fruits AND veggies!) guide you to exciting, new, and fresh eating experiences. Craving more? We’ve got you covered, indulge in more of our favorite winter recipes from 2017.